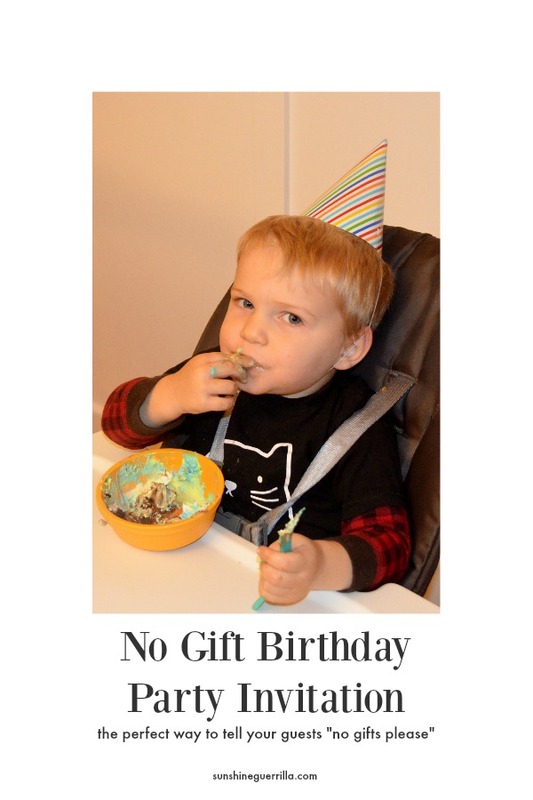 The "No Gift" birthday party is becoming more and more common, and for good reason. I love these parties. Our kids have ENOUGH toys (seriously, so. many. toys), so we are having all of our birthday parties (for the foreseeable future) be gift-free. 1. It's better for the planet. The most commonly given gifts are toys and those toys are most often plastic. That plastic is proving again and again to be terrible for our children's health, and since it doesn't decompose, they will have to deal with all that trash many birthdays from now. 2. I want to raise my kids a different way. I actually love gifts- it's my love language, but I am trying to not let it get out of control, because I don't want them to solely associate celebrating with receiving. I want them to focus on memories, experiences, and traditions. Gifts are fine, but I want to start them off in life not associating love with stuff, fun with stuff, or holidays with stuff. 3. The Gift-Opening at parties is high pressure and boring. I hate that part of parties. Yes, every so often you get a great reaction, but then there is the rest of the time. I would rather have a party that is actually fun! And as a guest, it is so nice to make a card and just go without the last minute run to Target. 4. Less cleaning for me. Yeah, I said it. I spend everyday cleaning up after two tiny people. More stuff is more to figure out how to store and clean, and they just don't need it. 5. They don't care. When we have little kids, it can (sometimes) be hard to differentiate what they want and what we want for them. But a 1 or 2 year old doesn't really understand the concept of gifts. They don't miss them and they don't see anything different going on. In preparation for his brother's birthday, our son asked what gift we would get him. Gift, singular. He thinks that is normal. Now, before you clutch your pearls, I can clarify a few things. Yes, my kids still get some gifts. We get them 1 physical gift and 1 experience gift. Their grandparents still buy them gifts. These are not deprived children, but we don't associate the party with wider friends and family with presents. No, I am not sure we can do it forever. My elementary school, it may be a different story, but at least these first 4 years, I know we can pull it off. But Yes, it can be done and, for us, it has been worth doing. If you are trying to raise your kid to be a minimalist, an environmental steward, or just someone who doesn't clutter up your living room, a great first step is cutting off the connection between celebrating and getting a bunch of stuff. Have confidence, parental unit! Celebrating and making memories really is enough. Even if you are psyched about the idea of a party with no gifts, it can be hard to bring the subject up with your guests without sounding ungrateful. 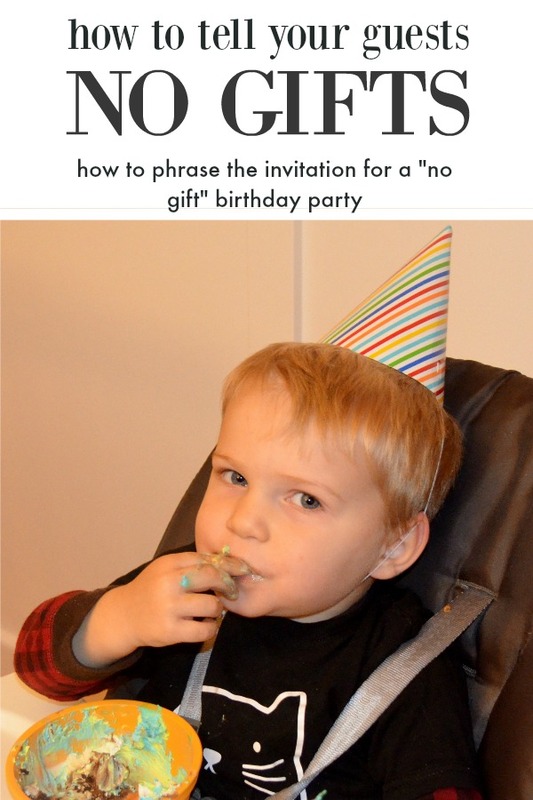 In some areas, the "no gift party" isn't too far out of the ordinary. In others, it will blow people's minds. So how do you tell guests not to bring gifts? First, keep it casual, fun, and non-preachy. You don't have to give a manifesto. I find people feel most comfortable if I am a little bit silly about it. "Buster has everything he needs. Please no gifts, we just want to celebrate with you!" "Your presence is present enough. Buster will be so happy to celebrate with you!" "Buster has more stuff than anyone ever needs. If you would like to give us all a present, please consider taking something out of our house!" "Buster really only wants to play with the garbage, so bring a box from your recycling for the perfect gift!" "Please do not come bearing gifts!" "Buster is currently obsessed with giraffes and has everything he needs. If you would like to get him a gift, consider donating to the World Wildlife Fund!" "Please bring a picture (a photograph, a drawing, whatever you would like!) for Buster instead of a gift to add to his special birthday book!" "No gifts, please please please"
Yay! You did it! First steps completed! 1. You let go of the idea that this will universally work. You are giving people permission to not bring a gift, but somebody still will. Maybe because it's their love language. Maybe because they just can't get comfortable with the idea. But their relationship with your kid is independent of you, and you honestly only get so much control. Let it go, friend. It's still a success if you cut down. 2. Don't make a big deal of the gifts that Buster receives. If it is from someone likely to stick around to the end (like Grandma), open gifts when the party thins out. If not, take a video or picture of your kiddo opening to add to the thank you card or message. 3. Don't do the goodie bag. Want your guests to buck consumerist norms? Then you have to do it too! I work at a place that hosts birthday parties- I have seen tons of them. Kids do not care about the fiddly junk in goodie bags. If they do care, they will soon forget. If you want to send something home, try making a craft or having an extra treat for that purpose! Fun games or activities make a fun party. Goodie bags? Not so much. 4. If someone asks or presses, push the experience gift. People will ask when they RSVP, you can just keep sweetly saying no. 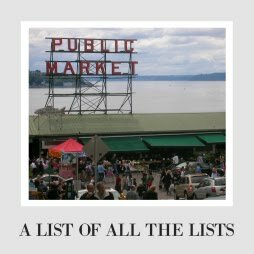 A promise for a trip to the zoo or a membership to the aquarium or piano lessons might be the perfect gift for someone who just can't miss the opportunity to gift. Plus it may give you a break! If they want your suggestions of what your kiddo needs, the answer can always be "more time with you"- who can fight with that? 5. Start now. If you have a baby or toddler, instituting this tradition is SO EASY. They don't come into it with expectations, and they are plenty psyched to eat treats and play with friends. Our son straight up rejected all of his second birthday gifts because he was still focused on the one we gave him (yes, we only give one gift- with one party and one big surprise. That's our winning formula). Older kids can require more delicate discussions and expectation-shifting, but honestly, with tiny ones this is a no-brainer. 6. Have a fun party! Sometimes the simplest ideas are the best. If you lose the present-opening portion of the party, you can fill that space with more games. Or you can just let them play. It doesn't have to be complicated, just be ready to have fun yourself. They will remember the fun they had way longer than the gifts they get (how many birthday gifts can you name from when you were little?). Focus on whatever will make the day fun for your little one, and everything else will seem natural. 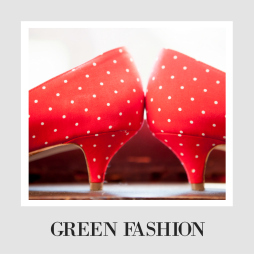 Want more ideas on how to raise eco-friendly kids while keeping your sanity? Check out this post. Have you ever thrown a "No Gifts" party? How did you pitch it to your guests in the invitation? Have you been invited to one? Did you bring a gift? Why or why not? These are wonderful tips! It can really hard at times finding the right wording. I also like the non gift approach for my own child and for other kids. I'm always left wondering about what to buy for a kids birthday party because most kids have already so much I feel it's pointless to get them more. I can totally relate! We don't even have birthday parties being that we don't want them to get so caught up in everyone else. Birthdays are for THEM and what they truly want to experience. Not for the party people or for the reason of getting gifts. This is great! Last year we told guests no gifts, but if you really want to give something just make it small....only one person out of 20 did this, but at least one did �� I'm going to try your wording suggestions next time. I've been struggling with this for my son's 9th birthday. He doesn't want to say "no gifts", but if someone can't afford a gift (he has a few friends who might be in this predicament - heck, we've been in that predicament before! ), he'd rather they show up and play at the arcade with him. Apparently "gifts optional" is viewed as a pretentious "we can afford everything and nothing you give will be good enough anyways" by some... and since I don't really know much about his friends' parents, I don't know if anyone will take it that way and don't want to risk it.